les anti-modernes*: #askLAM: rad statement necklaces? last month, reader Allison asked for my recommendations for a fun and versatile statement necklace. "I would love it if you would consider doing a post on good necklaces like this, fun ones that you could pair with a sweatshirt. I love the Object & Totem necklaces but they are very heavy and I don't like something that heavy around my neck all day." this is such a great question, Allison! (and touches on one of my best accessories purchases in recent seasons.) 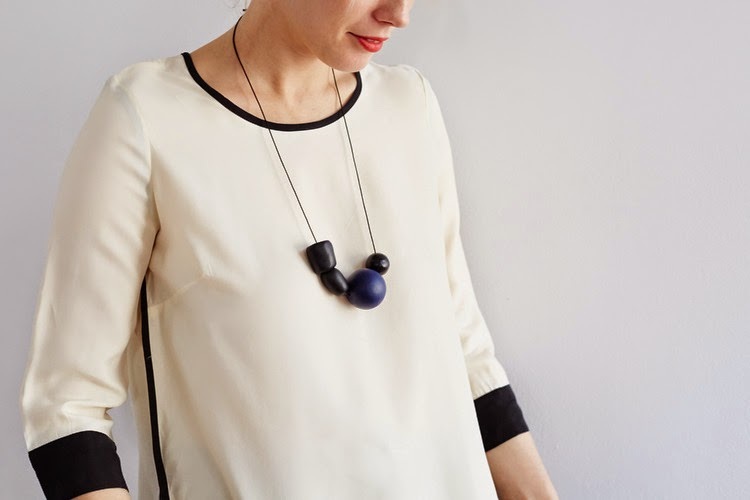 my favorite pick is this simple and organic statement necklace by Academy Jewelry, or this cool ceramic one by Highlow. i love the clean, geometric shapes, and that they're made in limited quantities by local designers. as my personal style has evolved over the years, i've come to realize that a few great statement necklaces can do wonders in the wardrobe refresh department. pair with a simple heather grey sweatshirt, and you've got a great low-key chic combo for so many occasions. do you have a favorite statement necklace? how do you like to wear it? Great photo. I picked up a couple of gorgeous Vietnamese horn necklaces in Luang Prabang in December - they are such a good alternative to my other statement necklaces. So light and durable. Very reminiscent of Hermes and Marni. Ammu - those sound so lovely! i love that the best ones are wearable art. I like necklaces, butttttt the reality is I don't wear them very often. I love erin considine necklaces.